In October 2009 I attended two meetings driven by climate-change. Both were in slightly obscure corners of the City that I associate more with nightclubbing and hedonism than sorting out the future of humanity. The IPPR's meeting about their report "Consumer Power" on the UK population's attitudes to making low-carbon behaviour 'normal' was well attended by a fairly wide range of people from my observation. Though all were very much in the choir and not needing much preaching to themselves. The main point for me of the report was its claim that the majority of the UK population already knows about and accepts the reality of climate change. In some cases with a heavy heart (just mentioning it in the authors' workshops with the public made faces fall and shoulders slump). And most of those amongst us already ready to do the right thing for its own sake ('Pioneers' at ~40%) and driven by internal goals and not in order to get the approval of others are probably doing what we can. The 'Now People' (part of the 30% 'Prospectors') targeted by this report, tend to set trends and be very stubbon about being told what to do and are driven by the approval of their peers through fashion and (say) a nice car and home to show off, care about humour and money-saving and desirability. They are typically suffering severe 'climate fatigue'. 'Education' and force-fed facts may be counter-productive and unnecessary. Don't focus on climate change. Focus on saving money now (we're all poor discounters of future value). Prevent the rebound effect (money saved on heating shouldn't be spent flying round the world!). Talk about carbon pollution, not CO2 emissions. Satirise high-carbon living (humour/fun is good, guilt not so). Though I had expected those present to be 'soft' on the numbers (believing as some hope that one can 'wish' or 'market' away the physics) that was not the case at all. Amongst other panelists was Tracy Vegro of DECC. In common with other DECC staff that I've dealt with, seemed very open and candid and to be trying to Do The Right Thing. That alone is quite positive to me. The report is free and well worth a read or at least a skim; link below. CIBSE hosted a discussion on "Dynamic Demand Management" to be summarised for their house journal. One problem was that we were talking at cross purposes about "dynamic". Those focusing on to cycle-by-cycle load deferral in response to grid frequency (including me) had a very narrow definition in mind, whereas others simply meant a broader spectrum of response to changing power availability and costs and carbon-intensity. DDM on the short-term or wider range of scales promises to cut costs and carbon emissions while allowing more intermittent (eg wind) renewable energy onto the grid. It's clear that though a majority of UK domestic and commercial users understand and accept human-driven climate change, the terminology is so new that it still leaves us all confused. Whatever the words used, if we accept that for whatever reason we cannot support business-as-usual demand-driven electricity consumption with 'callable' generation (eg "peak oil" or avoiding climate change or natual gas as a political weapon), then if the lights are not to go out demand will have to be increasingly matched to supply, not the other way around as we have been used to for ~50 years. Renewable sources in particular are intermittent, and the 'perfect storm' of a cold dark (little solar) still (little wind) day stopping much of our generation will happen from time to time. And that means that "demand control" and "dynamic demand management" will be with us increasingly. It is already in place with, for example, frequency-support/load-shedding contracts with the National Grid, and notably may or may not bypass the usual power supply chain. At the meeting it was discussed whether domestic or commercial (or all) users could make a meanigful contribution. Most felt that only commercial was on a large enough scale, though I feel, as with domestic microgeneration, that getting consumer 'mindshare' is important, even if it gets less tangible bang-per-buck at first analysis. Things that were felt to be likely to be useful would for example to adjust the charter under which the UK grid operates from lowest-cost "load order" to instead bring in demand control first to balance supply as happens in California already. Simply raising energy prices a little is unlikely to be much of a stimulus at less than 1% of turnover of an avarage business. DDM would be more likely to be seen as a risk by management than a boon. Even with the prospect of a £100k/year cheque per year from National Grid for each 1MW of air-con that could be dynamic-demand driven for example. So yes, it is going to happen and already is happening. But it's not at all clear what shape it will take (though is likely to be a very diverse range of technologies and measures) nor how much of it there will be. Energy (eg electricity) suppliers with lots of intermittency in their portfolio would love to have access to more demand control, which may be a big driver. Whether its turning down Sainsbury's air-con for ten minutes when a line trips or having a manufacturer ramp up production for day when a front comes in. CIBSE may well have a role in educating its members! 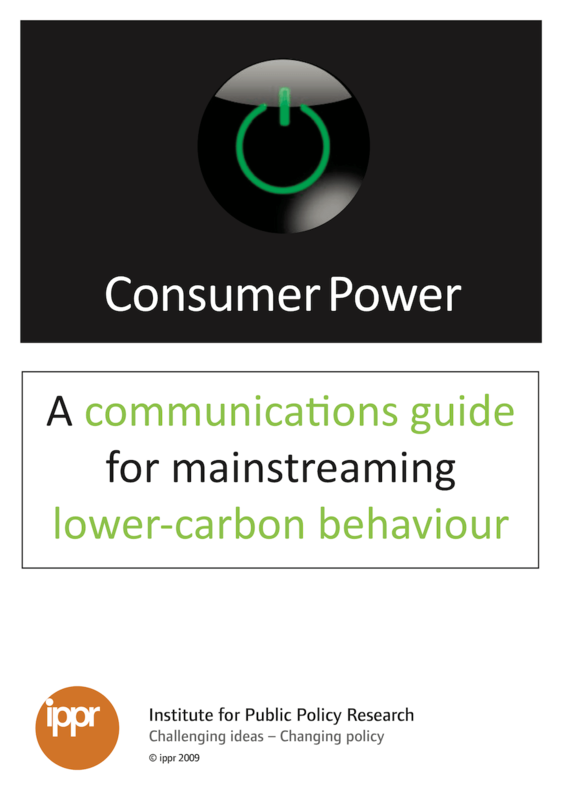 The IPPR's October 2009 report Consumer Power: How the public thinks low-carbon behaviour could be made mainstream. 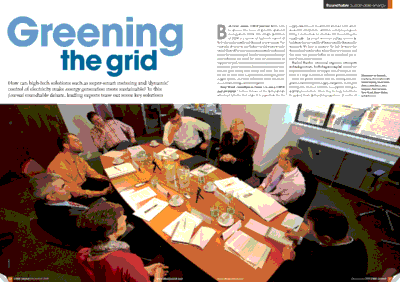 CIBSE Journal December 2009 p20/21--. Customers don't understand "demand response" and similar terms in 2009. First published 2009-10-14 , updated 2019-04-22 . Site copyright © 2007-2019 Damon Hart-Davis. Hosted by ExNet.